Human Error by Shulamit Lapid is an Israeli thriller by this bestselling author. 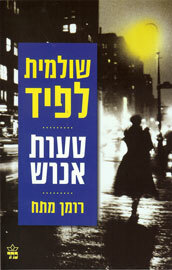 Ms. Lapid is a famous Israeli writer, known for her complex characters and engaging story lines. Human Error by Shulamit Lapid tackles issues from the point of view of a female Mossad agent. Ruth Perlmutter. Ruth is not a femme fatal, but a professional agent, a thinking woman trying to investigate the murder of an ex-colleague. Ruth is not your usual investigator, she is, of course, bright, but is reluctant. She knows she’s playing against the “boy’s club” who never really accepted her as part of them, even though they admire her work and dedication. Ruth tries to look like an old lady, someone no one remembers , yet she runs a successful travel agency which the Mossad uses often. The interesting aspects of the book, pits Ruth against her own world, the only one she knows and the one that is her moral and emotional support. Ms. Lapid uses Ruth to show the reader the human aspect behind those we believed to be superman, and recently flawed beings. The Mossad is regarded, first and foremost, as an organization with professionals which sometimes use their position to help themselves out in their daily lives. Ruth Perlmutter, a retired Mossad agent and owner of a travel agency, has been asked to investigate the murder of Arthur, and ex-colleague from the Mossad. The death leads Ruth to investigate her colleagues, find ex-lovers and historical letters written by Theodor Herzl (the founder of the Zionist movement). Dis­claimer: I borrowed this book.